What if my car gets towed? Dugger’s Road Rescue in Albuquerque & Rio Rancho, NM and Dugger’s Emergency Roadside Services are available in the Greater Phoenix, AZ metro. They are tow industry leaders who believe the customer should come first. We are a second generation family owned and operated business. If you live in the Phoenix Metro or the Albuquerque Metro, the only name you need to remember is Dugger’s. Look for our tow service trucks with flames on them in New Mexico. If you are broken down on the side of the road, you are worried. Look at our track record of satisfied customers in our roadside services reviews. 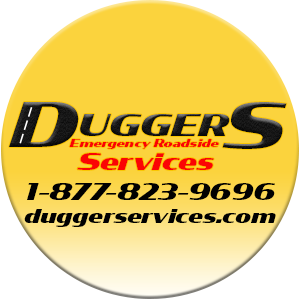 Dugger’s Services delivers the replacement battery, fuel or tire change service that you need, where you are; NOW! When you are looking for industry trained towing and emergency roadside assistance experts, the only service you need is Dugger’s. The next time you need a tow, have a dead battery or run out of fuel on the side of the road, Dugger’s Road Rescue and Dugger’s Emergency Roadside Service can save the day! Really nice guy and got spare on to replace flat in minutes. Very concerned he met all the needs to get me going and gave me sound advice in driving with undersize spare. Thanks so much. Highly recommend. Tommy was efficient and pronto, and had excellent customer service. A real master of his craft. He got my keys out of my truck in minutes and was very professional. Thanks for saving the day bro! The driver was very courteous and prompt, thank you very much! I rated this service 7 months ago and today I used the service again and I still rate it at 5 's! The driver Ricky Bobby's customer service was excellent! He was very helpful and very knowledgeable. I would recommend along for him if at all possible! The dispatch was readily available to handle the special attention needed with my call. Thank you! My roadside assistance with Dugger's service was great. With the rain and my understanding that many car owner were facing the same circumstances, the overall service was still great. The wait time was not a bother and the fact the towing took less than 20 minutes to get going, was proof how great their team is! I think the gentleman's name was Demi, anyway, he arrived within the time he said he would. Hooked up my pickup, and got it to my house quick and safe. I was impressed because I asked him to drop it off in front of my garage and I couldn't have parked it any better. Professional and friendly and efficient!